Old bicycle disposal options are fairly limited. Why? Well, just like with many other types of used possessions, these aren’t exactly in high demand. When you’re ready to unload that bike, just what can you do with it? So, let’s take a look at a few old bicycle disposal options are available. Since a bike is a simple machine when it comes down to it, repair is generally an option. Often times, it’s not all that complex. But, even when it is involved, there are local repair shops which can easily handle the job. Of course, the cost of repair is a huge deal because it can exceed the cost of replacement. If this is the case, it’s just not financially feasible or realistic. Even if the cost isn’t all that much, it’s important to note any bike over ten years in age will really be problematic due to the fact those parts are practically impossible to find. Sell it. If it’s not rusted and corroded, and in otherwise decent condition but just needs a bit of TLC, then you might well be able to sell it. Place an ad online and sell it locally. Or, take it to a bike shop and see if you can consign it. Perhaps the shop would buy it to resell or for parts. Repair it. Okay, if you know what’s needed to get it back in working condition, then you can opt to repair it and continue to use it for at least a few years. Donate it. For those who are replacing with an upgraded model, you might consider just donating it to a local thrift store or charity. This way, you get a little tax write off and do some good in one shot. Just junk it. If the bike is just too old, out of date, and needs too much work, then it’s time to get a new one. So, call a junk removal service to pick it up and haul it away. Plus, you can use the opportunity to offload more unwanted junk. 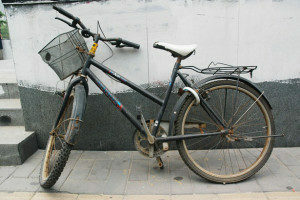 If you need old bicycle disposal, go ahead and phone 800-433-1094 or visit Junk Garbage Removal.